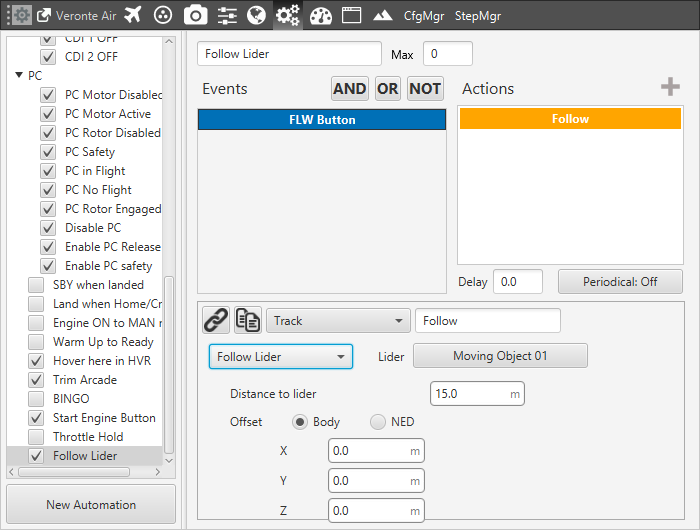 This action is used to configure a hover/loiter route (depending if it is a multicopter or an airplane) for the platform. Besides, there exists an option to fly the aircraft by the movement of a camera installed on it (fly By cam) and an option to follow a moving object. There are our different options for the Track action, selecting Disabled no action will have effect on the guidance. The others are explained below. The aircraft will loiter/hover in a selected point. Selecting Current will make the platform to hover over the position that the vehicle has when this action is triggered, or loiter around that point in a circular route with a radius indicated in Distance. It is also possible to select the direction of the loiter (Auto, Clockwise and Anticlockwise). On the other hand, the box (Longitude, Latitude)in the figure allows the user to select the point where the hover/loiter will be performed. The direction of flight is controlled by the movement of a camera. Let’s consider that there is a virtual stick on the workspace that controls the movement of a gimbal that contains the camera. The horizontal movement of the stick that controls the yaw axis of the gimbal will act directly on the yaw axis of the aircraft. Considering that the longitudinal axis of camera and vehicle are lined up, the aircraft will point all the time to the same direction as the camera. On the other hand, the vertical movement of the stick will control the vertical axis of the gimbal. When the direction of the gimbal intersects with the ground, the vehicle will stop (or loiter) when being at a certain distance away from that intersection point (that distance is indicated by the user in Distance). 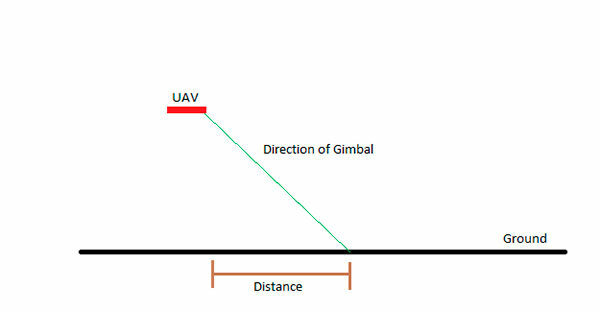 If the vehicle is hovering because the distance is reached, once the gimbal vertical axis is risen again the vehicle will move again in the direction indicated by the gimbal. The following figure explains what has been said in this paragraph. The platform (Multicopter) will follow an moving object. Leader: here is selected the moving object i.e, the object to follow. Distance: distance to lider over trajectory. Offset: user can establish offset parameters related to trajectory in Body or NED coordinates. 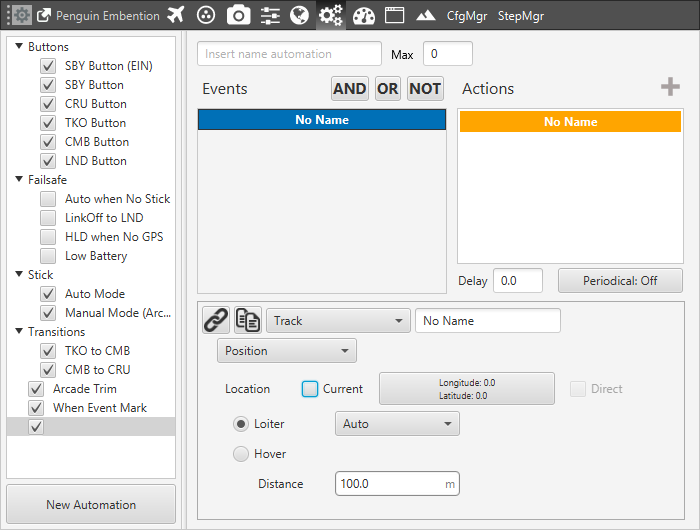 Configure Telemetry Air and Ground. Configure the automation as desired.